I have been holding off on this post for a while as I am in 2 minds (no pun intended) about the Douglas & Laing Double Barrel. My past experiences with Douglas & Laing has been very good and I am big fan of the Big Peat. Douglas & Laing excel at the Vatted Malt / Blended Malt, and independent bottlings of all your favourites. You may in fact already be familiar with their Old Malt Cask expressions in your local stores. The Double Barrel releases are something of an enigma in the whisky world in that they have chosen some very popular dual Single Malt whiskies and vatted / blended them to create some very unique flavours. In this case this is a Highland Park & Bowmore combination. 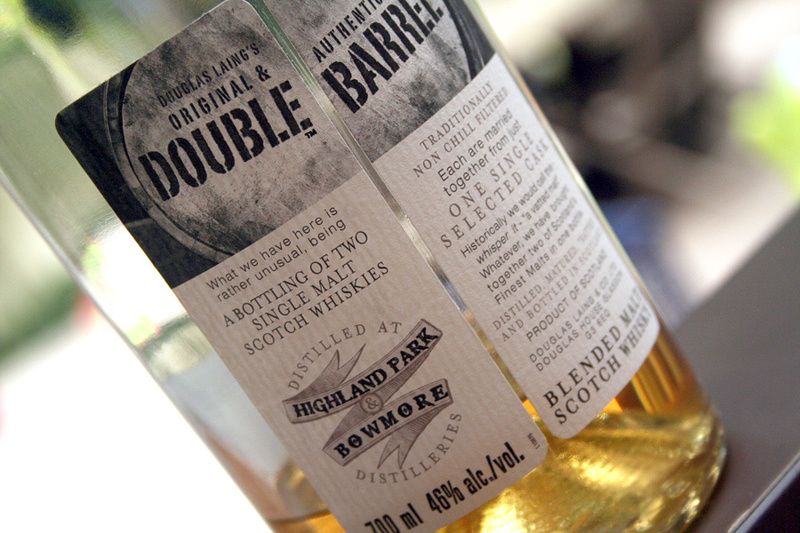 Douglas & Laing have also released other Double Barrel expressions, all dual barrels, and this is just one of a few. Always keep in mind these are two by one off barrels combined so the quantities are not large. If you see one and want to try something fresh and unique this is the way to go. As an interesting question to consider is the naming order of bottling being Highland Park first and Bowmore second. In the wine world the naming convention of bottling such as Cabernet Sauvignon indicates that Cabernet is the primary volume of contents with Sauvignon the lesser. I would be curious to know if Douglas & Laing have also named in this order. Colour is very light colour almost straw with a mild tint of green round the edges. I have not seen a lighter colour whisky except that of the Bruichladdich Octomore. It certainly makes me think about how long these whiskies have spent in the barrel as there is no age indications (not that age is a problem in my books) and it is clear the wood has not had a massive effect. The nose is light, mildly smokey, fresh floral's and straw with vanilla oak highlights. Though light I find it quite alluring to nose for some time. To taste though this is where it all falls apart for me. It lacks a richness and body I love in a Highland Park and takes on that 'stretched' sense I always get from the high smokes of a Bowmore. The clean floral notes sit at the tip and below the tongue that then moves quite quickly to a spicy burn in the back of the throat. It certainly is not a pallet saturator like a Highland Park. Somehow though it still balances out quite well. Finish is actually rather long and extended with a mild heat in the chest and lots of spices enriching the top of the throat. Many tend to think that a finish in a whisky needs to be hot in the chest but this certainly breaks that mould quite well. Overall I want some tacky stay in the mouth still but then I like rich saturation's. Balance is actually very good in an pole to pole sense making me happy to have tried this whisky. I can see this as a great introductory whisky to someone wanting to experience the peat of Islay but not adventure too far off the beaten track. Also this would be a great evening starter, especially if you are not sure what to have, as it allows your pallet to swing between that peat, smoke, floral's and vanillas. Overall if I was to give a dram then it would be a 4 1/2 out of 7. Great value at $43AU a bottle even when you are generally looking for something with more depth in the bag. I think the lads have done a splendid job here even if I personally am looking for something more.